FREE FROM FEAR is an uplifting and positive musical tapestry which combines deep conscious lyrics and rich honey vocals with the sounds of Reggae, R&B and Soul. The music is a celebration of life and an expression of gratitude for the power and potential that we all hold within. Sarah Christine’s latest release WHATEVER IT TAKES is a collection of raw and intimate solo acoustic tunes recorded at the beautiful RainMoonSun Sanctuary on Vashon Island. 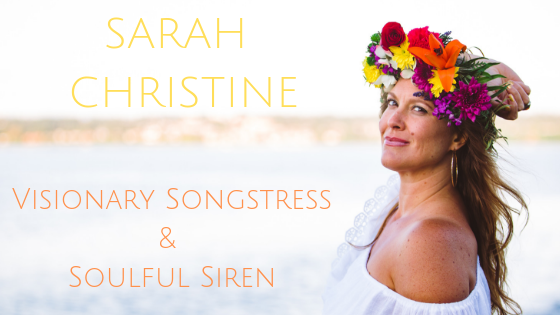 The songs are a snapshot into Sarah Christine’s life with deeply reflective tracks about determination and motherhood in Whatever it Takes and 27 Moons. She also takes the listener on a journey into the forest and waters edge on tracks By the Sea and Believe. The album features fresh versions of early tunes such as I Like, Freedom and Angels in Disguise which were written at the beginning of her songwriting career. Finally the newest song to make the album is called Be the Change which was inspired by her recent performance with Michael Franti. In a conversation back stage he explained that his life mantra is BE, SERVE, ROCK! She resonated with the message and wrote a song about it.